"Haunting, disturbing…unforgettable… not since John Pilger’s 1979 Year Zero has there been a documentary as important"
"No Fire Zone shocks on every level. It shocks, it educates and it convinces"
"I can confidently say that No Fire Zone ... is the most devastating film I have seen"
"Brilliantly put together….journalistically sound…. No Fire Zone is an absolute must see"
"I hope David Cameron, William Hague, Prince Charles and everyone else going to the Commonwealth heads of government meeting in Sri Lanka next week saw the shocking No Fire Zone"
"A difficult… enraging watch… Tragically its essential viewing." "Horrific to watch.. If I had one criticism of the documentary is that it wasn't long enough." No Fire Zone was nominated for a prestigious International Emmy Award. The award recognises films that can demonstrate the greatest impact upon society. “An important documentary of our times… a painful and moving journey ..a documentary that needs to be seen.” Vaclav Havel Jury, One World Festival, Prague. We are pleased to announce that No Fire Zone was awarded the Vaclav Havel Jury Special mention at ONE WORLD FESTIVAL in Prague. This means that No Fire Zone has now won seven awards and jury special mentions and been shortlisted for the Grierson and the Televisual Bulldog awards. 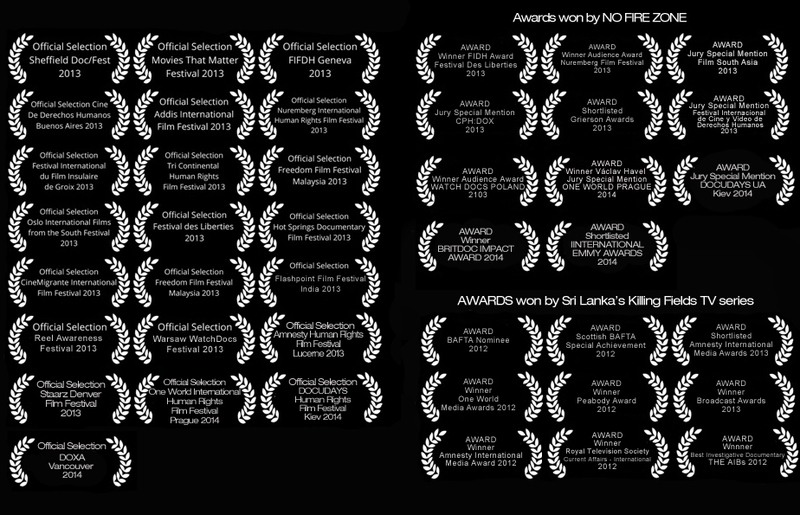 It has been an official selection in 23 film festivals and screened in more than 25 countries.